This is Entomology Week for me, since I’m taking a class on Tuesday with Dr. Mike Raupp – so it’s fortunate that I have some bug pictures to show you! 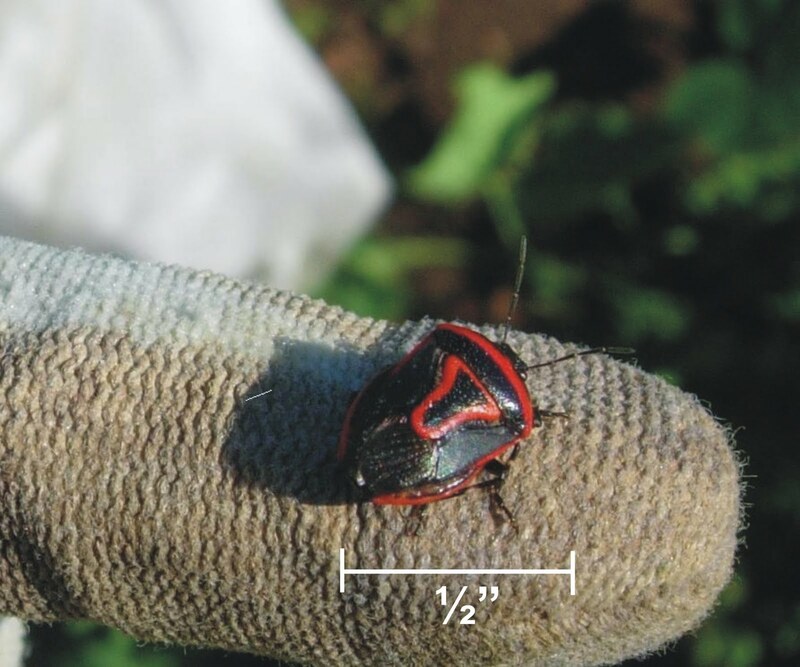 First exhibit was photographed in the demo garden this week and ID’ed for us by the friendly folks at HGIC as a two-spotted stink bug. Barbara Knapp showed me a larva that was a considerably brighter orange than the others, and also said that the larvae on the blue potatoes (which seem to be more attractive to the pests, though mine at home haven’t been attacked yet) were more purple in hue. You are what you eat, I guess. Another stink bug everyone’s been seeing a lot of (and I can’t believe I don’t have a photo on hand since I had a couple hundred of them in my house this winter) is the brown marmorated stink bug, which you can find information about here and here. I think I saw one in the demo garden this week, but it got away before I could positively ID it. 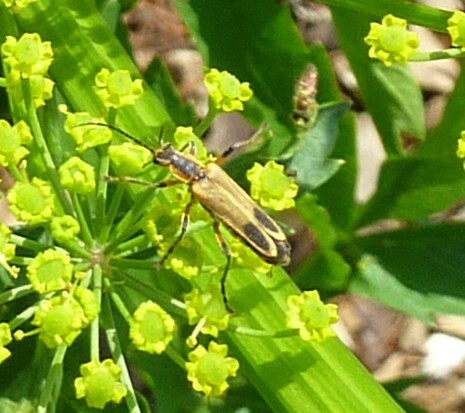 It’s a soldier beetle, an important pollinator (adults) and predator (larvae). I believe mine is the margined leatherwing. Remember to add lots of flowering plants to your vegetable garden (or, in this case, plant biennials that mysteriously go to flower in their first year) to attract beneficial insects. Small-flowered plants are particularly valuable in bringing in many predatory insects. 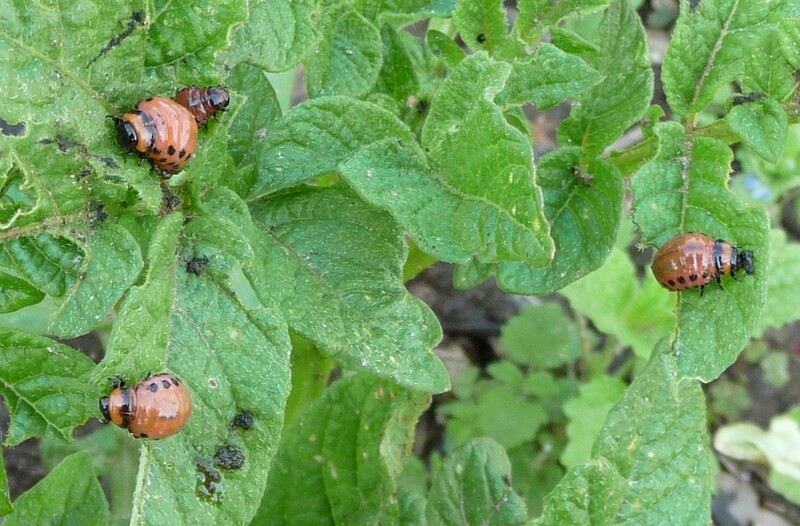 Harlequin bugs by Barbara Knapp, potato beetles by Nick Smith, two-spotted stink bug by an anonymous benefactor. 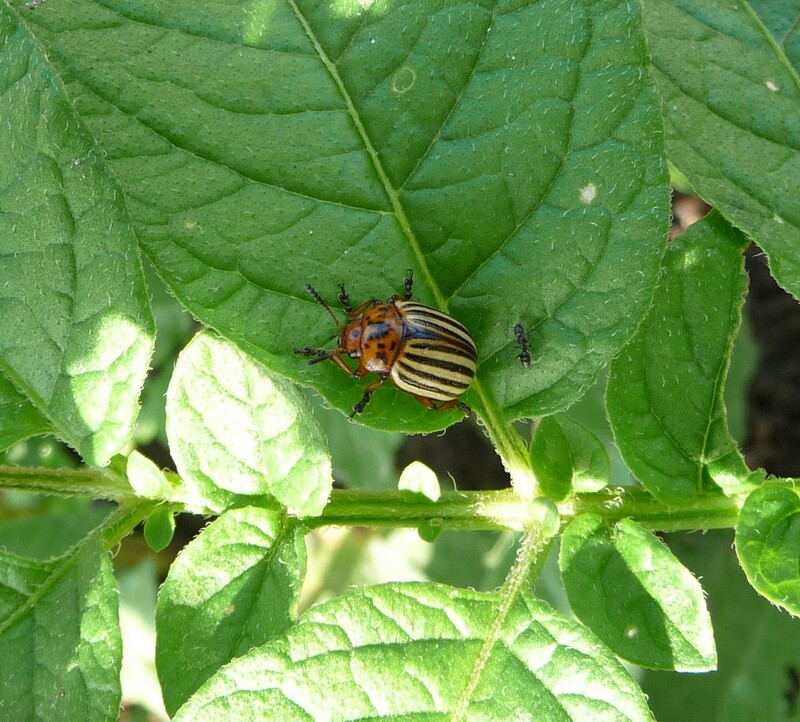 Colorado potato beetle feeds mostly on potato, a bit on tomato and eggplant and very rarely on pepper. it does not feed on melon or squash. 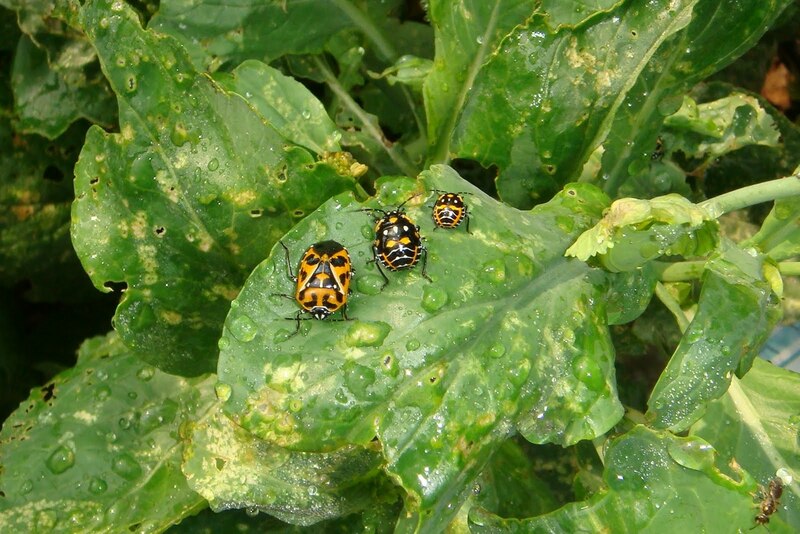 You may be seeing squash beetles. They lay clusters of very small bright yellow eggs.